I didn’t realise it was icy when I left for work one morning. I was pretty close to my house when I first came off the bike on black ice. I managed to bruise my elbow and rip a small hole in my expensive rain jacket. I’m not at my best in the morning and, instead of heading back home and taking the bus (which would have made me late for work), I thought I’d press on and be more careful. The thing is, cycling on black ice isn’t being careful. It wasn’t long before I came off again. I had stopped to turn right at a junction on a back road. The car facing me on the opposite side of the road had stopped to let me go. I mouthed a “thank you” and put my weight on the pedal. The back wheel spun. I seemed to go straight down, fast. 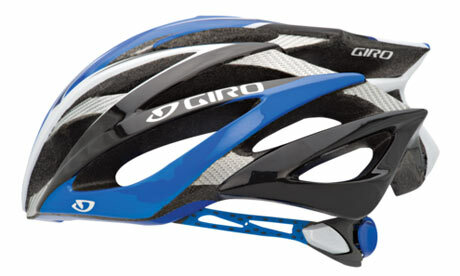 The helmet I was wearing slipped back as I fell forward and I hit my forehead on the road with a mighty ‘thwack’. There were two cars there and both drivers got out to try to help me, but both were slipping about on the road. Each time I tried to get up, I slipped. It took a while to get myself and my bike out of the road. I imagine it would have looked a bit like a silent comedy sketch. One of the drivers offered to take me to the hospital, but I was convinced I was fine and I was embarrassed (and possibly in shock). This kind and caring woman asked me to promise her that I would go to the hospital that day, so I promised and I walked my bike home. I called work to say I’d be late and explained why. They sent a colleague round to drive me to the hospital. I knew my eye was swelling as it was closing up and by this time, there was a surprising amount of blood. I was scared to look in the mirror, but when I did, it was clear that the cut was only small and it was the swelling that was making it bleed so much. I did go to the hospital. They checked me over and declared me fit and well. They sorted out the cut with glue and I got the day off work. Later that day the eye completely closed with the swelling. 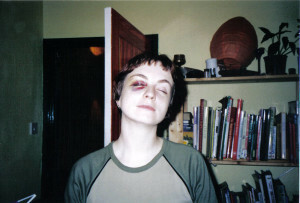 I remember, over the next week or so, I became fascinated with this black eye. Every hour it looked different, the colours were spectacular and seemed to go through the whole spectrum. And I really enjoyed the fact that I could freak people out by just looking at them (I had blood in the white of my eye, too). I’m now a bit of a stickler for making sure my helmet is on correctly.